A funny thing happened on the way to posting this recipe. I fell through a sourdough rabbit hole and am just now coming back to reality. Someday I will write all about that for it has been as strange and wondrous a journey as that of Alice herself. Although I love to mix up my own spices when I cook Indian style, there are times when I just do not feel like gathering up a lot of different spice jars and tins. This was one of those times when I was looking for something fast and easy. When I came across this recipe that calls for curry powder I thought it would be just the thing. And it was. It was easy, fast, and super delicious. It was good both by itself and with rice. It's easy enough to make at the drop of a hat and tasty enough to make for company. The first time I made it I used the full can of coconut milk as called for in the recipe. It was delicious, but more soupy than I wanted it to be. The second time I made it (see photo) I only used half a cup of coconut milk and I was happier with the consistency and it still had that luxurious coconut mouth feel and taste. I froze the rest in 1/2 cup servings for future use. A final note: I have said this before and I'll probably say it every time I post about a recipe that uses curry powder. There is nothing wrong with using a commercial curry powder. Just make sure you are using a good one. My favorite sweet curry powder these days comes from The Spice House. Heat the oil in a large saucepan over high heat. Add the onions and saute until they have started to brown, about 8 minutes. Add the curry powder and cook for a minute to let the flavors come out. Add the cauliflower and garbanzo beans and cook for another minute. Add the tomatoes and coconut milk and bring to boil. Reduce the heat to medium-low and cover the pan. 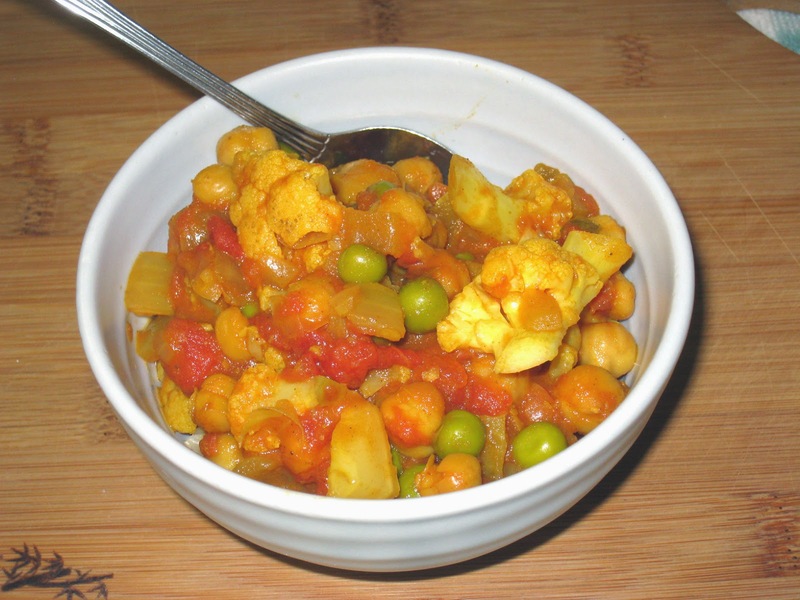 Simmer until the cauliflower is tender and the liquid has thickened slightly, stirring occasionally; 10 to 15 minutes. Season to taste with salt and pepper. Stir in the cilantro and serve.